This was taken not so long ago with my friends at work. I will never forget this happy day because it was the only day we had the chance to unwind before two of them left the country. Now only two of us in the photo are left working at the hospital where we all met. We had so much fun posing at a resort. The photo above was a shot of us before heavy rain came falling from the skies. In fact we were reprimanded by the guard for not keeping off the grass. 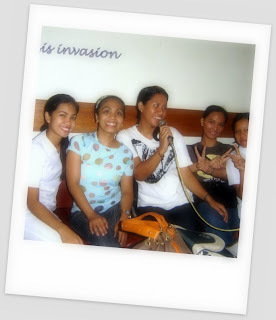 We left the resort for several hours of singing our hearts out and non-stop chatting and laughter and yep photo-taking. That was me imagining singing along cool bugles at musicians friend and trying hard to reach the notes of the only song I have the courage to sing in public. Music spices friendship and makes memories last in notes. psssst, parinig nga ng kanta mo. hehehe! labyew!! !